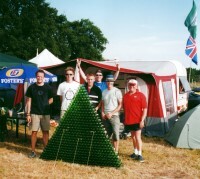 Camping during the Le Mans 24 Hours is a mixture of comraderie, fun and living on the wild side. There are a number of campsites around the circuit. For 2019, we are holding a variety of official Le Mans campsite places. These campsites are all very close to the circuit, within walking distance or by using the circuit train shuttle system. Every vehicle will require a permit to camp at the Le Mans circuit during the race week. This will give you approximately a 7m x 5m plot for your vehicle and tent. All camping areas are available from the Monday before the race until the following Monday. You will also require a general entrance ticket to access the camping areas. If you require more space (for a large motorhome or trailer for example) we suggest that you purchase extra permits. Alternatively, please call reservations to register for a larger pitch. Prices for Brittany Ferries & DFDS also available on request. Houx: Well located on the inside of the circuit. Numbered pitches. The only campsite to offer access to electricity. Also has showers and toilets. Houx Non-Numbered: In the same area and with the same facilities as Houx. However pitches are not numbered and allocated on arrival. Epinettes: In the same area as Houx. Has showers and toilets. Good gravel road around the campsite. Close to the tramway. Un-numbered pitches. 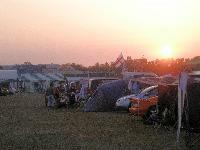 Maison Blanche: This campsite borders the track leading up to the Ford Chicane before the Start / Finish straight. Numbered pitches. It has showers and toilets but no electricity. Houx Annexe: Located close to the Houx campsite and very well located for the tram terminal to the centre of the circuit. Numbered pitches. Has showers and toilets but no electricity. Bleu Nord: Located on the outside of the circuit adjacent Bleu car park. Numbered pitches. A relatively short walk to the start / finish straight although some of the furthest pitches can be a trek. Has showers and toilets but no electricity. Bleu Sud : Located on the outside of the circuit adjacent Maison Blanche. Numbered pitches. A short walk to the start / finish straight. Has showers and toilets but no electricity. Beausejour: A large campsite located in the centre of the circuit. Non-numbered pitches. Has showers and toilets. No electricity. If you want to camp and be in the thick of the action - but do not really wish to have to shop and cook, try our premier camping package. This all inclusive option offers travel, a reserved camping pitch, a general entrance ticket and silver service lunch or dinner in the superb Brasserie Restaurant which overlooks the circuit. Other campsites available upon request.